I was definitely right! Two Clif Bars, two packs of CLIF BLOK Energy Chews and two CLIF SHOT Energy Gels was the perfect amount of food for my 100+ mile / 6 hour bike ride. I love it when that happens. My jersey pockets get lighter and smaller as the ride gets harder and harder. The first thing that goes are the Clif Bars. Stored in my center pocket, they give me peace of mind that I won’t bonk later on. Next goes the CLIF BLOK Energy Chews. These bite sized chews are golden. They’re so good that I prefer them over regular gummy candy, especially the blue tropical punch flavor with caffeine!! The CLIF SHOT Energy Gels go last, because near the end of a ride comes my intense sugar cravings. Yes, you can see I’m pretty obsessed with cycling nutrition. Mostly because I’m pretty obsessed with riding my bike. I do big rides fairly often, so getting my nutrition right means I can enjoy a long day out rather than grinding my way home, slowly fading away, totally bonked. That’s why I’m always searching for new ways to stay on top of my nutrition. I couldn’t help but smile when I found out about the new CLIF® Nut Butter Filled Bars. I already knew they were going to be great before I even tried them. The reason being, several weeks before I was already experimenting with chocolate nut butter (Nutella) filled waffles that I was making for ride food. I was searching for something with a softer, more cookie like texture and sure enough CLIF Bar was thinking the same thing. They made a bar that melts in the mouth rather than sit there like chalk. CLIF Bar didn’t stop there; they made these new bars ORGANIC. Yes, that means these bars have REAL food in them and are not processed goop like some other companies. 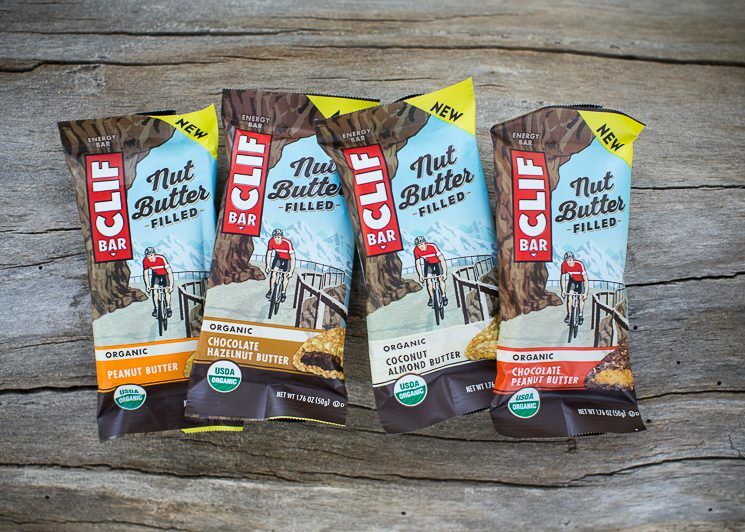 So next time you need some adventure fuel check out the CLIF® Nut Butter Filled Bars in Peanut Butter, Chocolate Peanut Butter, Chocolate Hazelnut Butter, and Coconut Almond Butter. Don’t panic, they’re Organic. * All four flavors are available at retailers nationwide with an SRP of $1.79. ~ The SoCalCycling.com Team is sponsored by Clif Bar.